Various operations are more advanced on the Konica Minolta c364e copier, and the operations give users a new work style. The most notable feature lets users use cloud and mobile devices; the feature is called PageScope Mobile. Users can use PageScope Mobile to print and scan documents from their mobile phones or tablets. Productivity is also increased due to this new feature, and operating costs are also reduced. Because of this, operation costs are lower because businesses do not have to use other services that cost money, such as Dropbox. Dropbox is a service that provides a work environment for offices. Because the copier uses cloud, these services will not be needed. Overall efficiency of a business increases as well thanks to information sharing provided by cloud/mobile/bizhub/ connectivity. The staff at Bay Area Color Copiers help many businesses stay efficient because they offer this particular copier at a great price. The Konica Minolta C364e just made it simple to use! 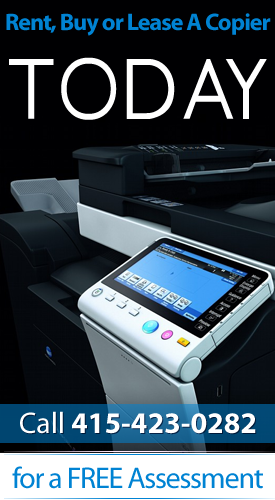 Easy to use devices are important for offices when they search for deals for copier machines. When users do not understand how a device works, overall productivity slows down. 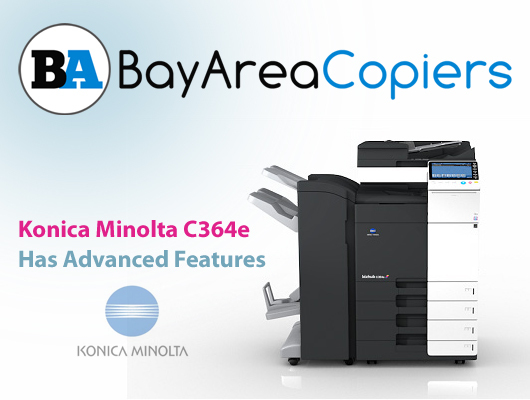 The Konica Minolta C364e copier is simple, smart, and ideal for all users. This is possible due to the INFO-Palette design; it is intuitive because it gives everyone the same experience in any work situation. This is important because all businesses are not the same. No matter what issues occur, this particular copiers can handle them. All employees can use the device in the office from their PCs, tablets, and smartphones. Bay Area color copiers understands the general features of this copier; this is why customers trust there expert advice. The Konica Minolta C364e operates like a smartphone. Due to its touch screen function, users can flick, pinch, and tap the screen, and this makes operations more comfortable and easier. Other more advanced gestures can also can used, such as drag and drop and rotations. The control panel also lets users download apps that are provided by the Konica Minolta marketplace. Although these features are unique, how the unit operates after the functions are used is what matters. This machine is fast during prints and copies. Productivity is important for businesses because some copiers do not work fast enough, or they are too slow for small office environments. This copier can be used in small to medium sized offices without any issues. The workload will never be backed up. Increased efficiency also requires increased security because businesses do not want their important documents swiped. Overall security has been improved in this Konica Minolta copier. 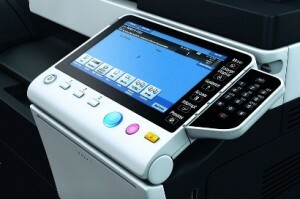 The international standard for multi function printers is included on this machine. The standard is IEEE 2600.1. As for the quality of the prints, this system has an exclusive Emperon print system. This system contains a next generation HD toner, and it provides sharper prints. All these features are possible when customers purchase this device from Bay Area color copiers. Big Energy Saving with Konica Minolta C364e. Reduced energy costs is another benefit the copier offers. No deals for copier machines are better than reduced energy costs. One particular feature is called the wake up function. The device will stay in sleep mode to reduce power consumption. Power is only generated in areas of the device that are needed to wake the machine. The device uses less than 1.0 watts while in sleep mode. Businesses who use this device enjoy the benefits it offers. Overall, the best deals for copiers machines are offered in this Konica Minolta C364e device.